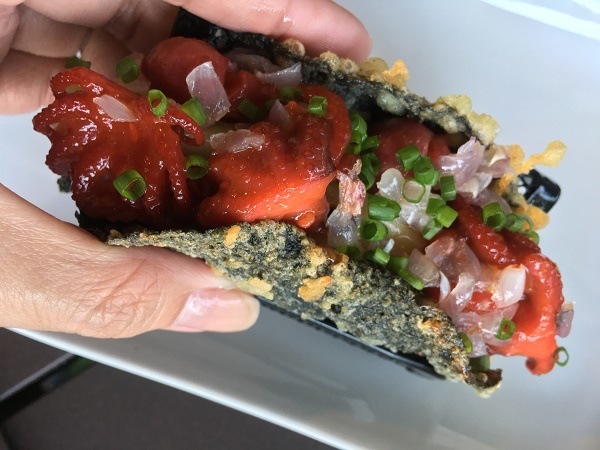 Add a little twist to your taco night with the crew -- this new treat recently rolled out by Torch Restaurant stuffs Japanese rice and fun sushi elements into a crispy nori taco shell. Torch is known for their trio of pizza, sushi, and steak -- and serving these in a funky, modern, fusion kind of manner. The restaurant gets playful with toppings and flavor combinations, and this time around, they are introducing a new lineup that could make your tippling more enjoyable. 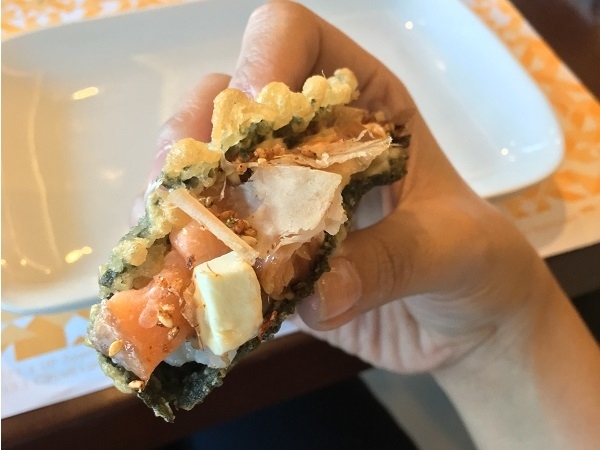 Taco meets sushi in the 'Noritaco' -- and the restaurant now has eight kinds of noritaco to snack on and pair with your drinks. So what's in a Noritaco, exactly? 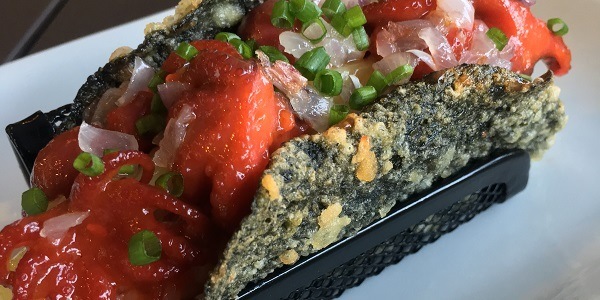 Torch's version has nori (seaweed) shaped into a taco shell, and it's battered and fried until crisp. 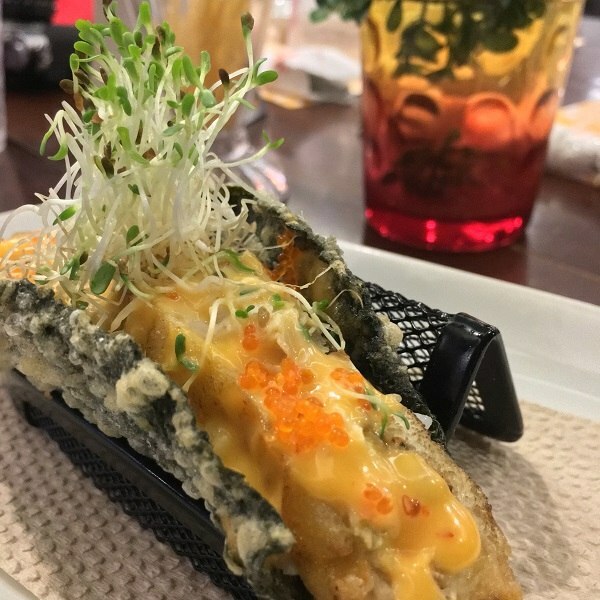 It's then stuffed with Japanese rice before it's topped with an assortment of ingredients, meat, seafood, and sauces. Expect playful combinations of toppings the way the restaurant enjoys modernizing their sushi creations. 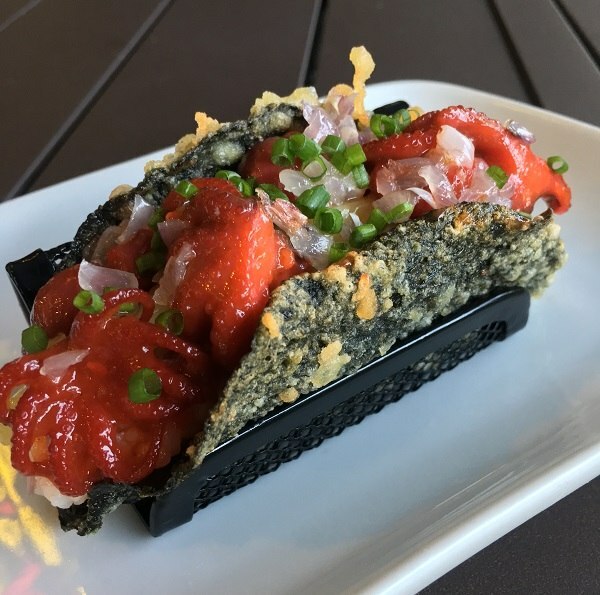 There are currently eight kinds of Noritaco to choose from: there's Kumo topped with soft shell crab, spicy mango, alfalfa, and tobiko; Kabuki with salmon, cream cheese, bonito, unagi mayo, and furikake; for something a little different, try the Chuka Iidako topped with spicy baby octopus, goma, cucumber, and spring onion. There's a vegetarian option with kani, mango, and cucumber; and there are also a couple of Noritacos topped with US Angus beef. The Noritaco menu is now available at all Torch branches: Connecticut Greenhills, UP Town Center Katipunan, Trinoma QC, Greenbelt 5 Makati, Circuit Makati, Molito Alabang, and High Street Central BGC. Like Torch in Facebook (/torchph) and follow on Instagram (@torchresto).